Highly honourable visitor from Japan - Mr. Fumiaki Terasaka, president of SAPPORO BREWERIES LTD., paid a visit of V.F. HUMULUS LTD. in the days of April 29th - 30th, 2012. He took part in V.F. HUMULUS general meeting, saw over the laboratory of V.F. HUMULUS in Destnice and green-houses for virus free rootstocks growing. 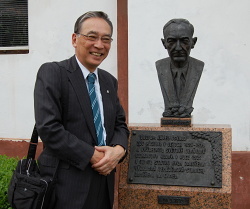 Mr. Terasaka visited the Pilsner Urquell brewery as well.